Mimaki has introduced upgraded Tx300P-1800 and Tx300P-1800B direct-to-textile printers to simultaneously load both textile pigment and sublimation dye inks. It allows the use of a single printer to print directly on a range of textiles without the need to change out ink systems. The company provides five different ink types for textile printing, comprising of sublimation dye ink, dispersion dye ink, textile pigment ink, reactive dye ink and acid dye ink. Mimaki’s new direct-to-textile printers hold capacity to simultaneously load TP400 textile pigment ink for cotton and hemp materials, as well as Sb420 sublimation dye ink for polyester material. The entry-level printers can be used by designers, fabric workshops and educational and research institutions. The TP400 textile pigment inks, which include solvent, pigment and binder agent, can be used for interior fabrics, T-shirts and various other apparel applications. Sublimation dye ink Sb420 has been specifically developed for use with pre-treated fabrics, including polyester. The Tx300P-1800 printer can be used to directly print on any type of natural or man-made fabric such as thick and woven textiles. With the support of an automated belt-fed conveyance system, the Tx300P-1800B printer can be used to print on modern stretchable materials. Mimaki Europe sales general manager Ronald van den Broek said: “Recently, in the textile and apparel markets, quick deliveries and short, customised production are becoming increasingly important. 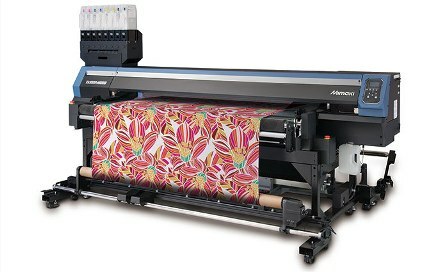 Image: Mimaki’s direct-to-textile printers can simultaneously load both textile pigment and sublimation dye inks. Photo: courtesy of Mimaki Europe B.V.